The words strategy and planning are often used interchangeably in the world of marketing and business; this can be confusing. A simple way to explain the difference between the two is to use an example. Our example is about the business plans and strategy of two cereal companies; Company A and Company B. Company A and Company B decide that they want to sell 3 million cereal boxes a year. Company A decide that they would like to do this through selling cereals which have their company's branding on the cereal boxes. Company B decide that they will make cereals which have their branding on the boxes and will also make cereals for supermarkets to sell with the supermarket's branding on the boxes. Once this has been decided both companies draw up a list of actions which describe what, where, when and how they will do this. 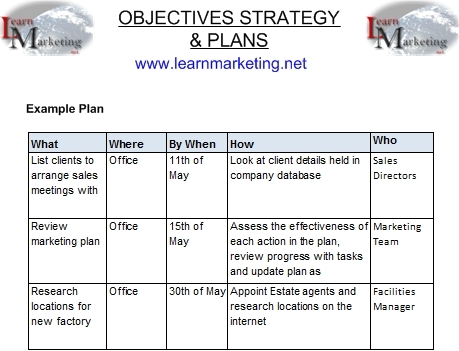 Let's label each of these activities as shown in the diagram below which captures the plan into 3 columns; objectives, strategy and plan contents. The plan writer (s) may decide to follow the SMART principles when drawing up the plan. For further information read our SMART Objectives article. 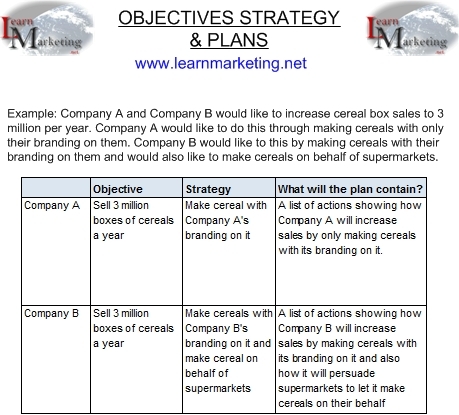 The table below provides part of an example plan to help achieve the objectives, of the fictional cereal manufacturers used above. The Strategy is the way in which the company would like to achieve the objective. It will decide the rules or framework that the plan should follow. The Plan describes the actions the company will take to achieve the objective.